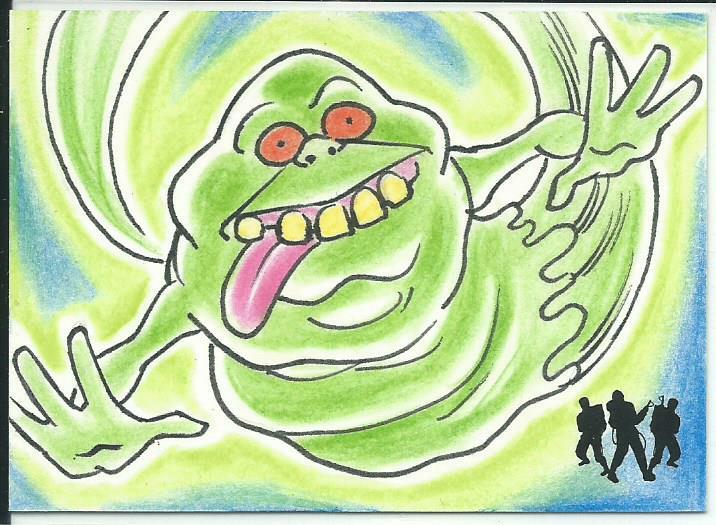 Today Nick Foles requested, and was granted, his release from the LA Rams. 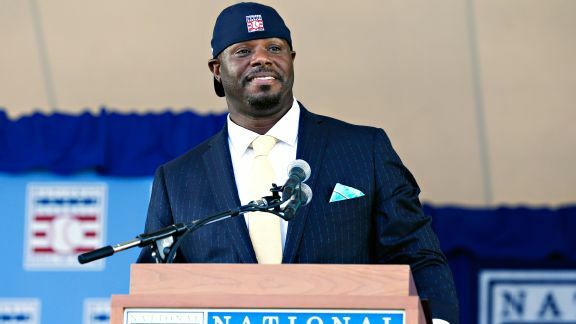 After the unexpected and totally confusing trade that sent him to the Rams his play declined and was eventually moved to a backup role and with the Rams drafting Jared Goff #1 it was clear that Foles was the odd man out on the Rams depth chart. 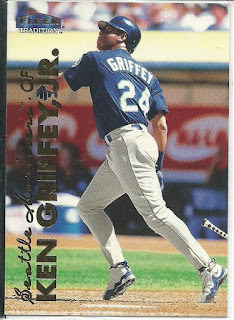 Rumors are currently tying him to Denver and New England. I had brought up him possibly going to the Broncos earlier this year and I can understand the reason New England may be interested I still think the Broncos are a better option because any time in New England will be limited to just 4 games this year while he could be the starter the entire season in Denver if he wins the position. 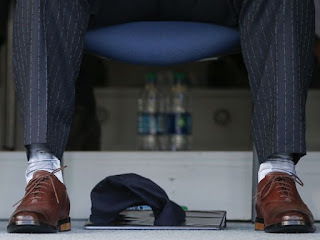 I am still a big fan of Foles, his time in St Louis should really be discounted because not even Russell Wilson could look good playing behind the Rams line, and I think he can still build a solid career in the right place with the right coach. 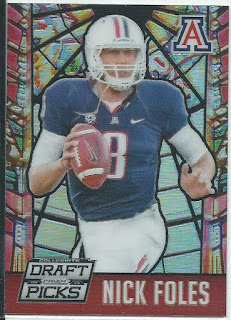 I picked up this 2015 Prizm Collegiate Draft Picks Nick Foles stained glass recently along with a number of other University of Arizona cards. 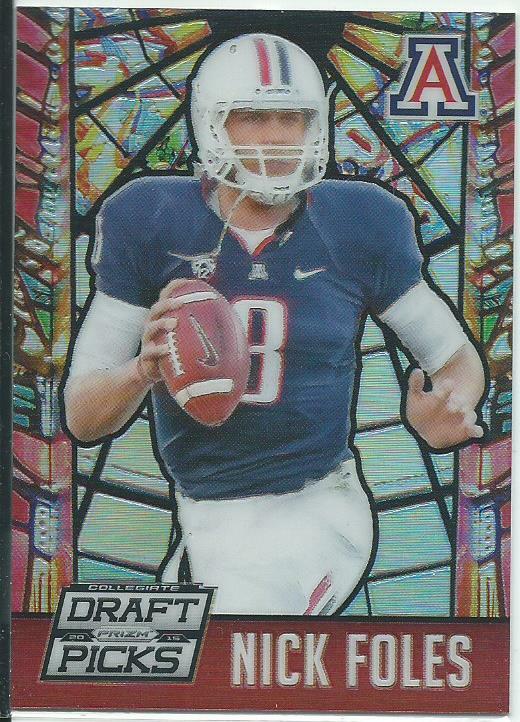 I don’t know what it is about a stained glass card but I just have to have them. 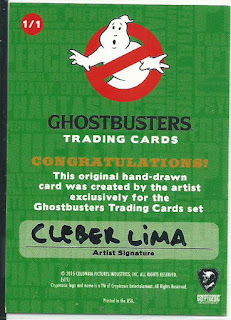 I saw Ghostbusters today, hilarious, so I figured this would be the perfect time to post about some recent pickups. 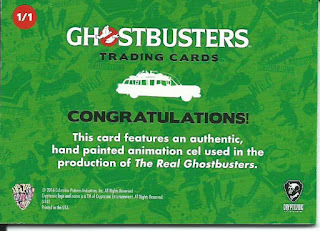 They are from the 2016 Cryptozoic Ghostbusters release. 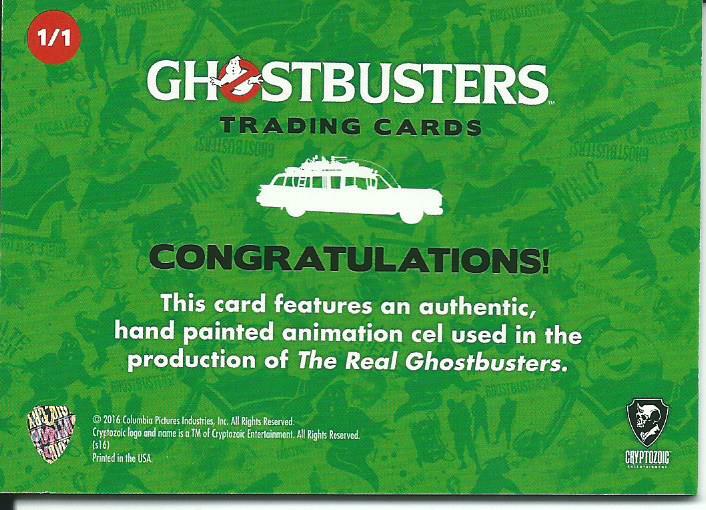 The base set is built on the original movie with inserts and subsets that also encompass the movies and animated show. 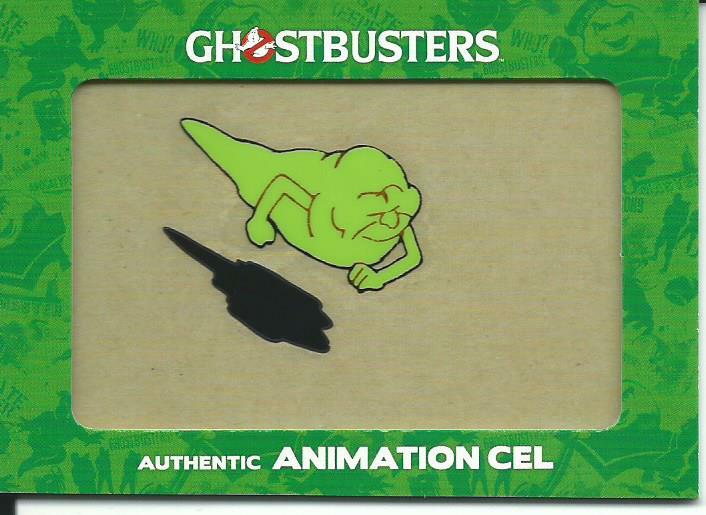 There are some very cool inserts including sketch cards, autographs, cels (from the animated show), Totally Fabricated slime and manufactured name badges. I was able to find a nice sketch card and animation cel, both containing Slimer. 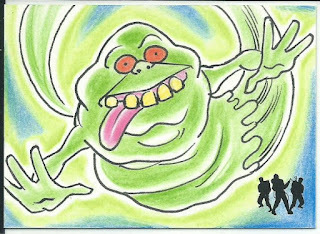 I am still watching for good deals and want to add a slime card, autographs and some cards portraying Ecto-1. 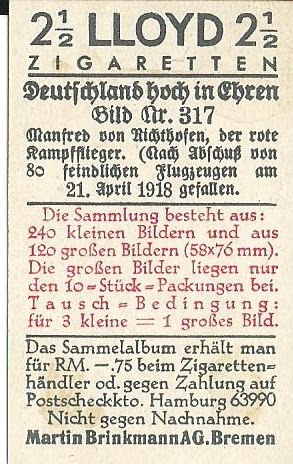 This month’s VCoM comes from the 1934 Martin Brinkmann Cigarettes release. 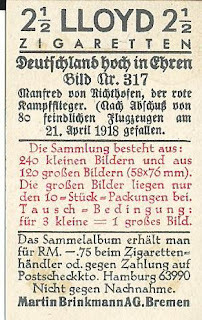 Martin Brinkmann was a major tobacco company out of Germany and during the 1930s in support of a strong nationalism surge they inserted tobacco era sized cards in to their packs. 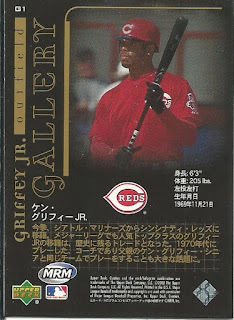 I have seen a variety of cards, all German related, like military, movie actors and daily life cards. The cards are a little smaller than a T206 and beautifully illustrated. 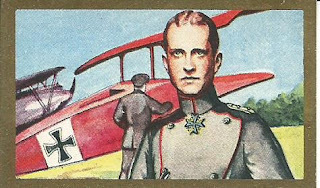 This is my second Manfred von Richthofen vintage card, the other a 1933 National Chicle Skybirds that I highlighted as the VCoM last April. I have been interested in WWI since I was young and the Red Baron has always been one of my primary interests and a number of his cards are included on my all-encompassing Want List. 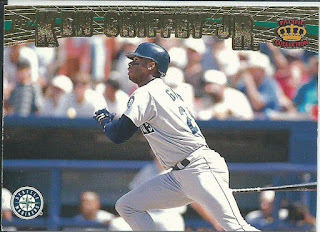 The card is wonderful condition and would grade nicely, the only real issue would be some staining on the back of the card. 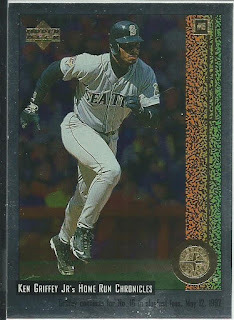 I am very lucky to have this card in my vintage collection and at a very reasonable price. 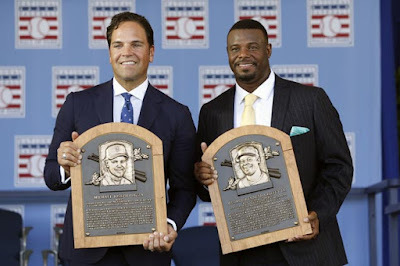 The Baseball Hall of Fame inducted its two newest members, Mike Piazza and Ken Griffey Jr. Two classy players who never got caught up in the steroid firestorm that still hangs over some players in their attempt to get in to the Hall of Fame. 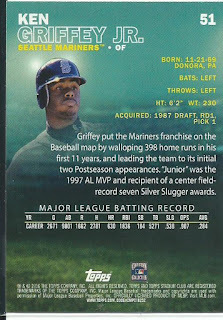 Griffey is the first #1 Draft Pick to get selected for the Hall of Fame, not to mention the highest percentage of BBWA votes, and Piazza is the lowest Draft Pick, at #1,390, to be selected for the Hall of Fame. 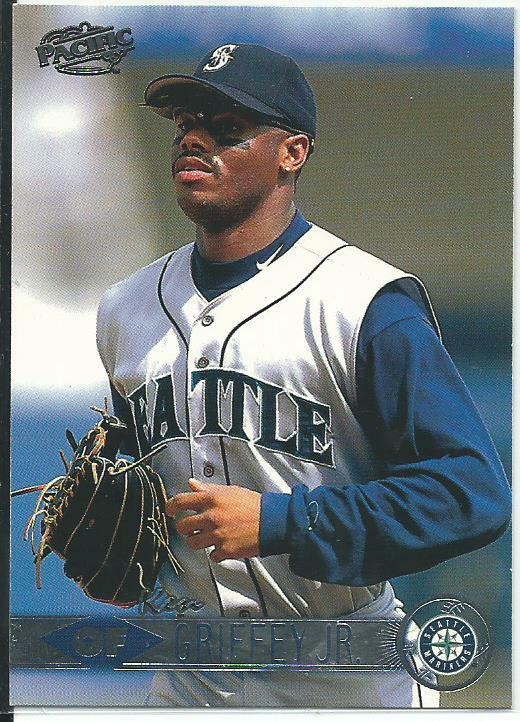 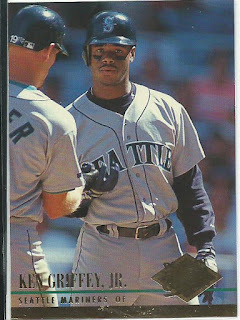 I watched the ceremony this afternoon and you couldn’t help getting a bit misty-eyed during parts of their speeches and I think that Griffey reminded us that he not only was the “Kid” but that he is still the “Kid” when he put his baseball cap on backwards at the end of his speech. 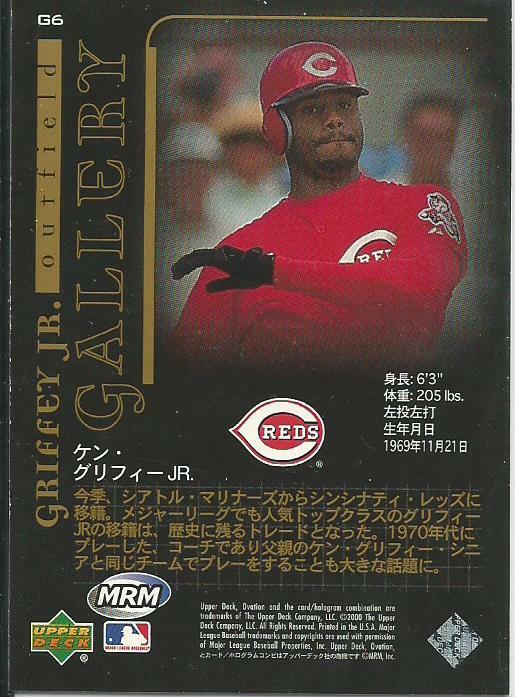 Griffey was a fashion statement from head to toe today. I quickly noticed the Swingman logo on his tie and of course his Mariner’s teal colored pocket square but at one point when the camera pulled in close I was able to see that his pin-striped suit was not just any suit but the stripes actually said “Hall of Fame Class of 2016”. 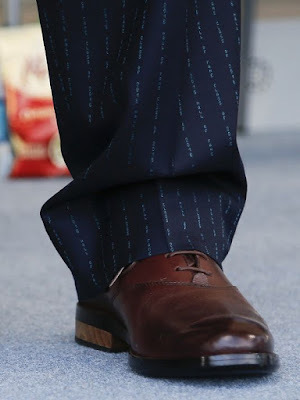 Now that took some imagination but the tailor who made the suit was not to be outdone because Nike stepped it up and designed his leather lace-up shoes with heels made from one of his game-used bats (that is one authentication I would trust). Toss in some Jackie Robinson socks and he was a fashion icon today. 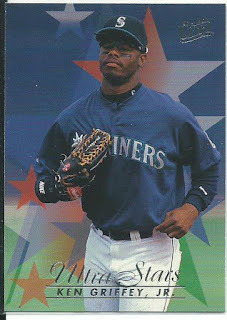 The final trade package that I am covering is my most recent, a trade with P-Town Tom from Waiting ‘til Next Year. 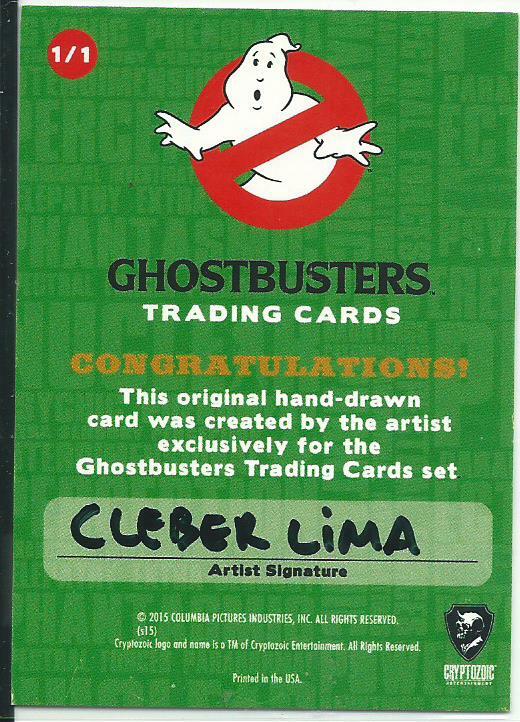 Tom reached out to me for a trade right before I moved so I asked to delay it a couple of weeks. 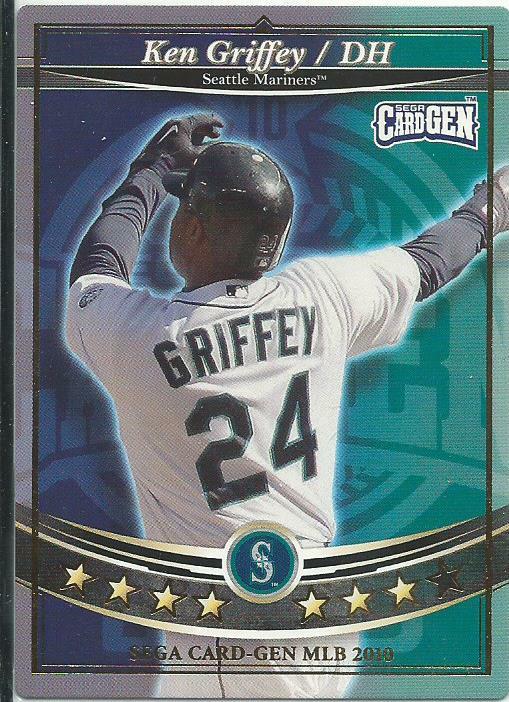 I ordered some cards for him that I am waiting on so he shipped his package this past week. 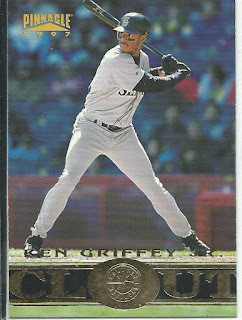 In all there were a couple of dozen Griffey cards plus a pack of 2016 Stadium Club, which I pulled a base Griffey card from that pack so an added bonus. 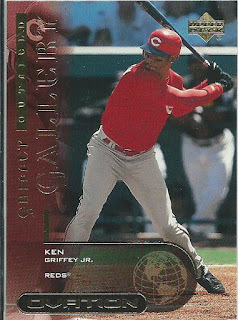 The cards range from 1993 Leaf All-Star through 2000 Skybox Metal and I needed every one of them with a couple replacing ghost cards. The trade package I am covering today comes from Ryan of This Card Is Cool. 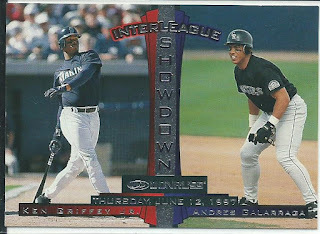 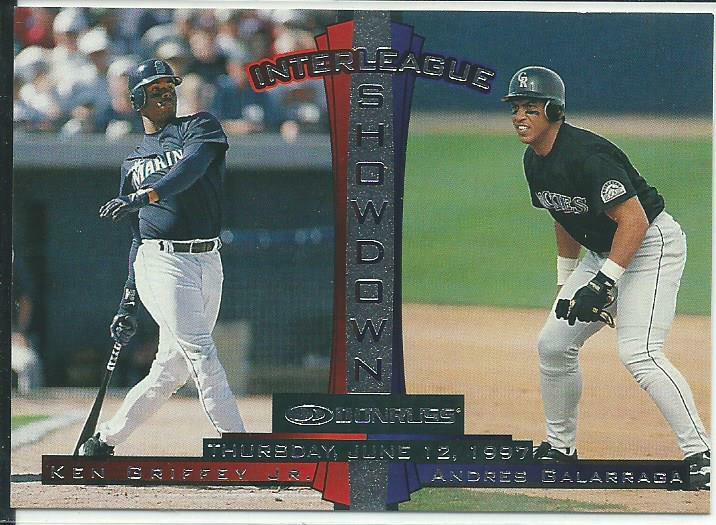 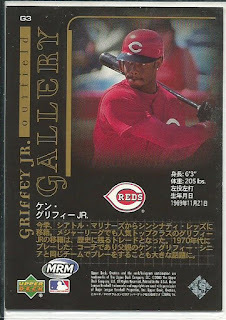 This trade included some of the coolest and rather rare Griffey cards from Japanese sets. 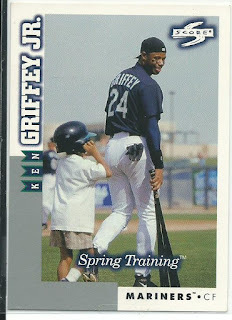 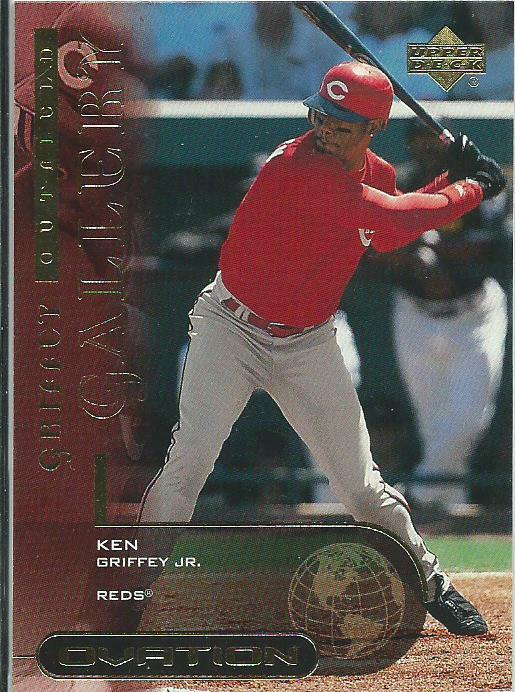 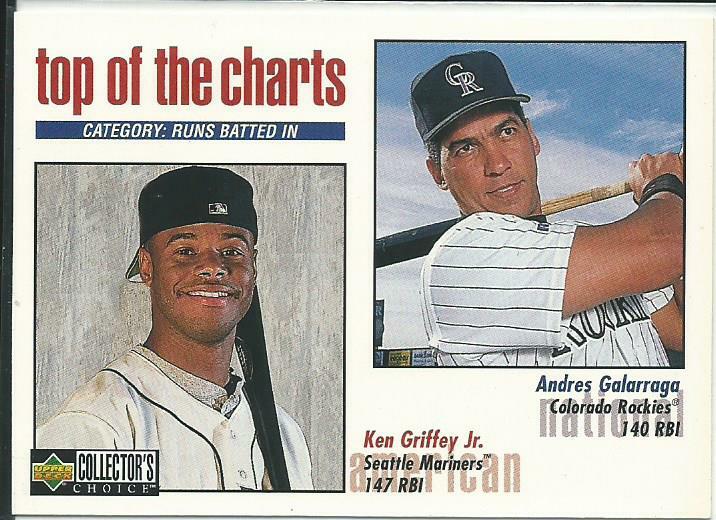 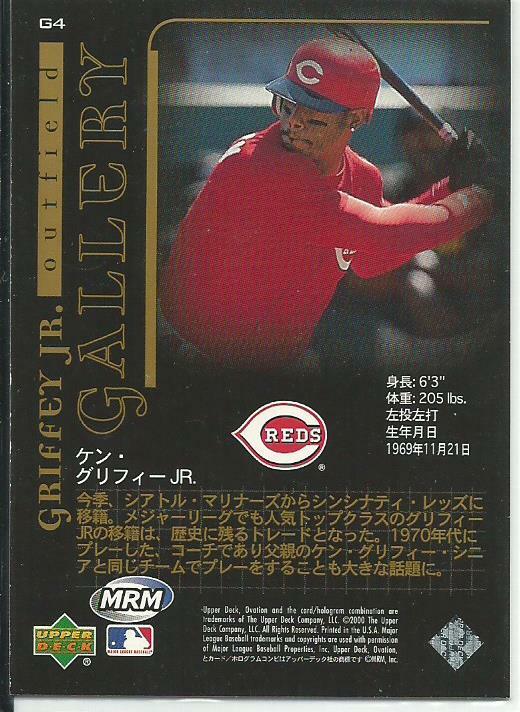 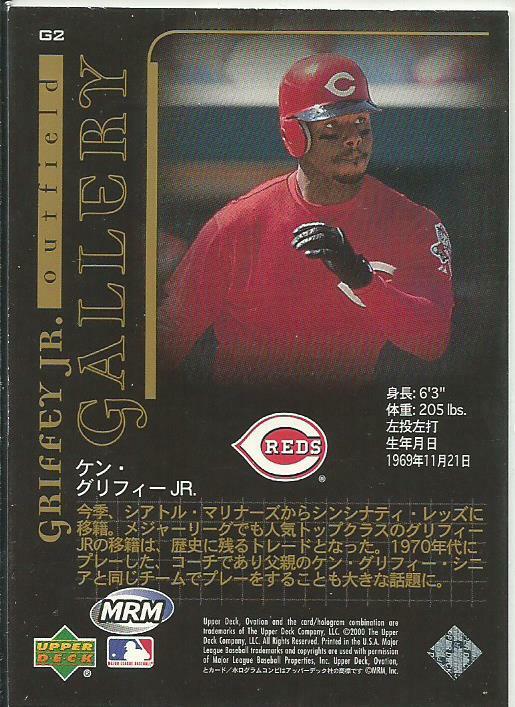 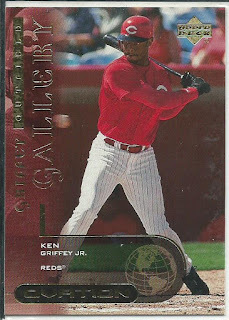 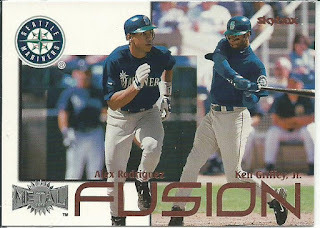 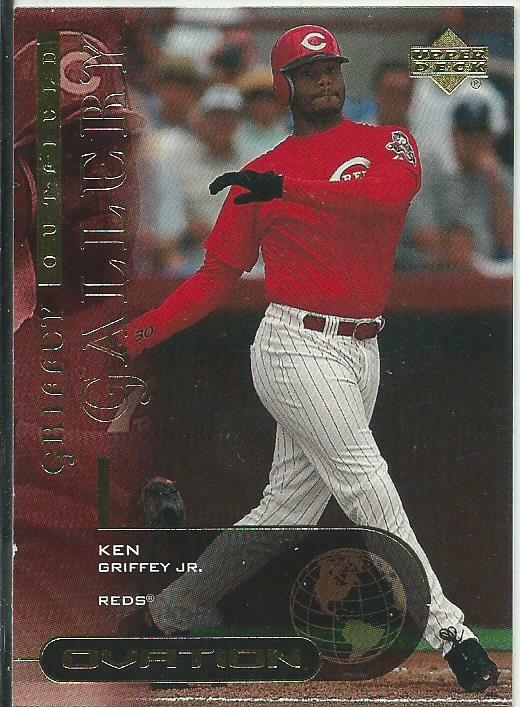 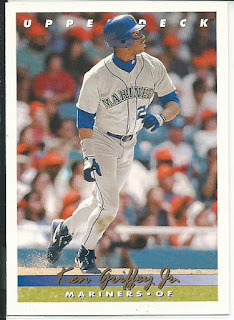 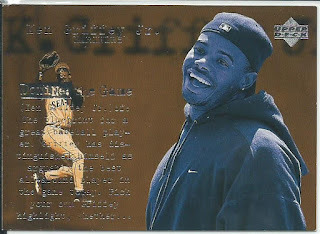 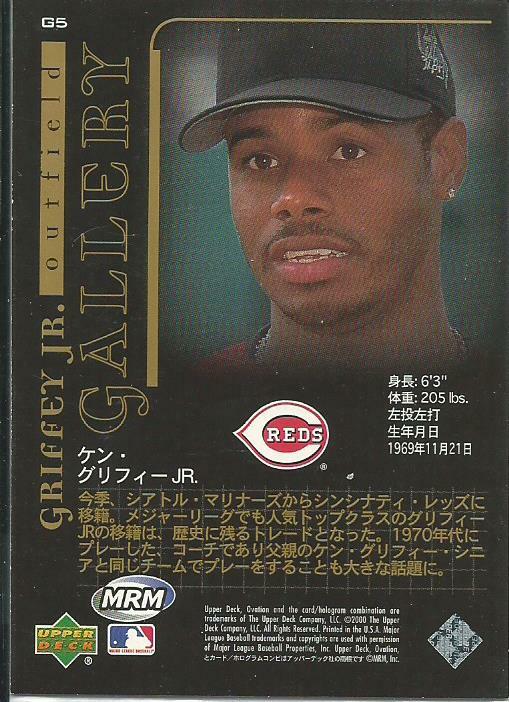 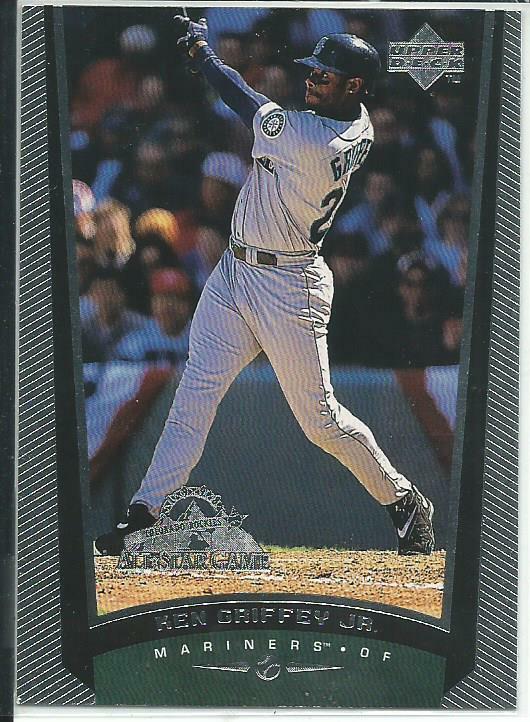 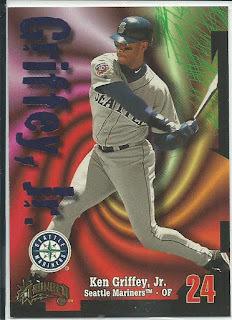 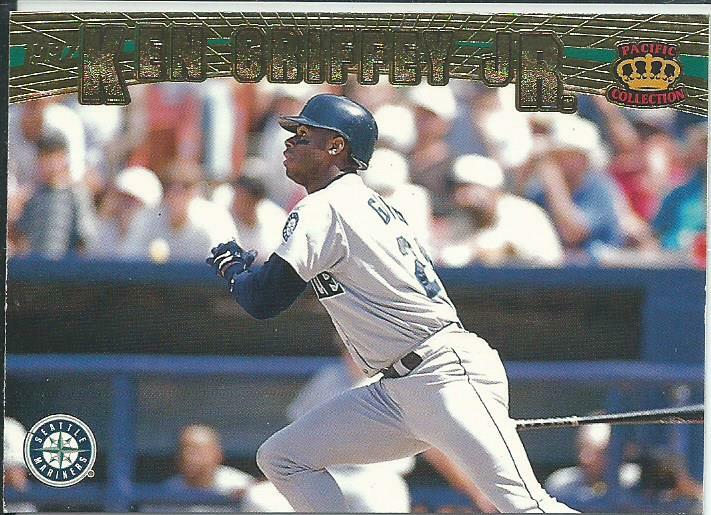 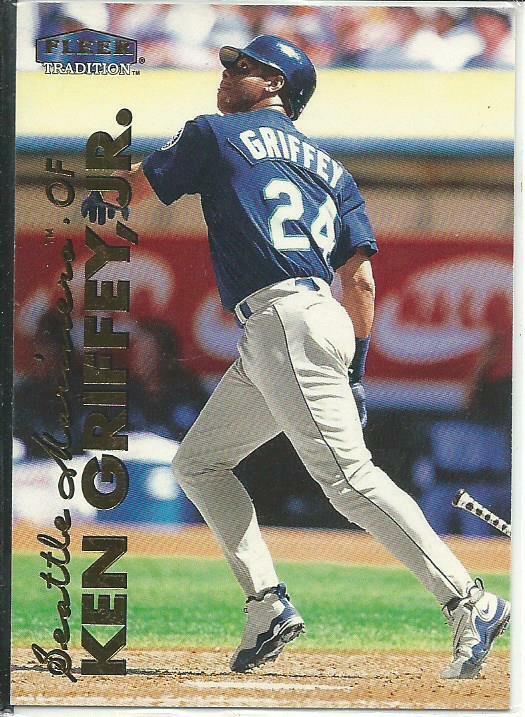 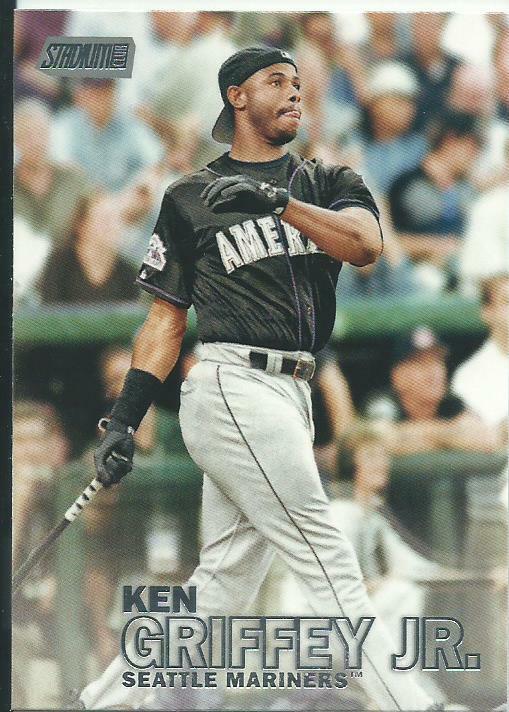 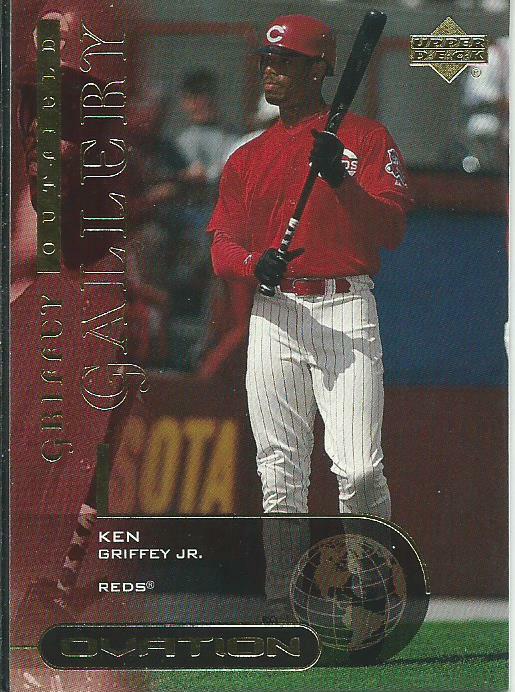 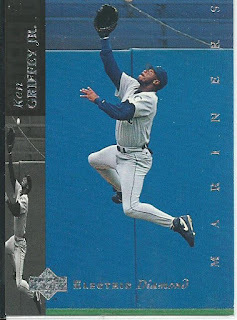 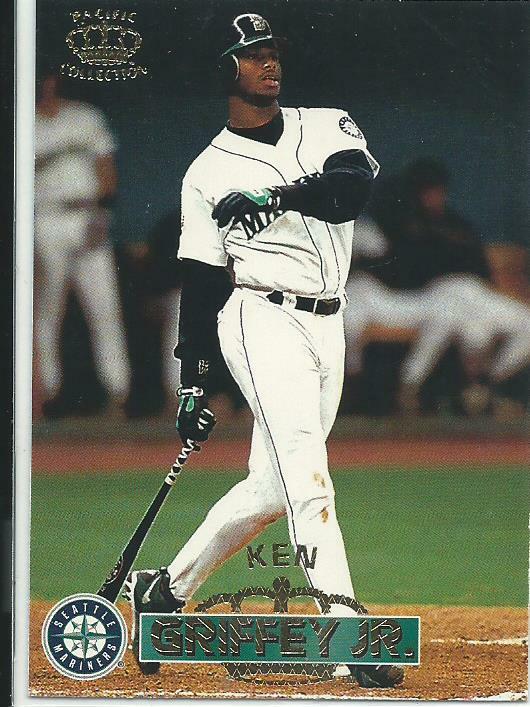 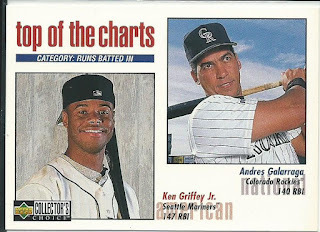 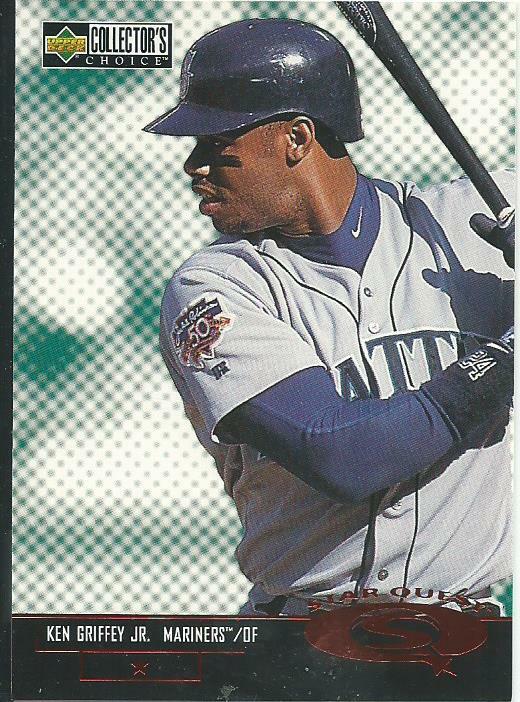 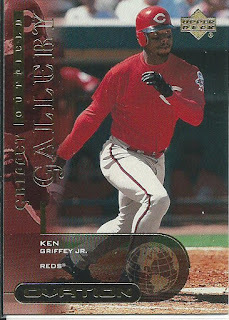 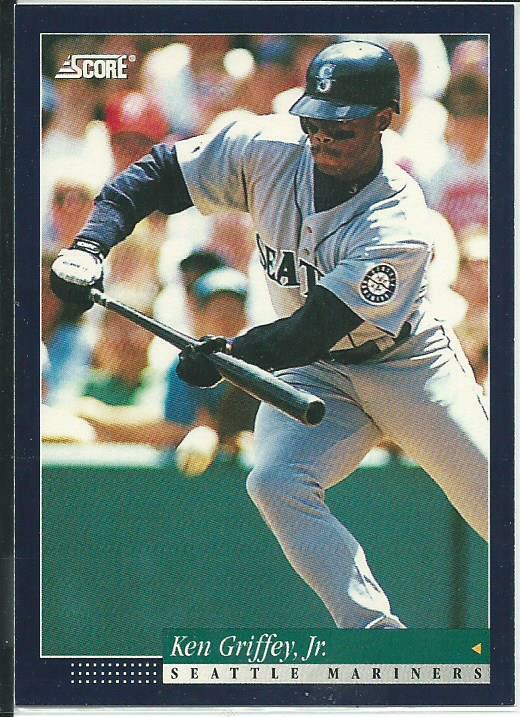 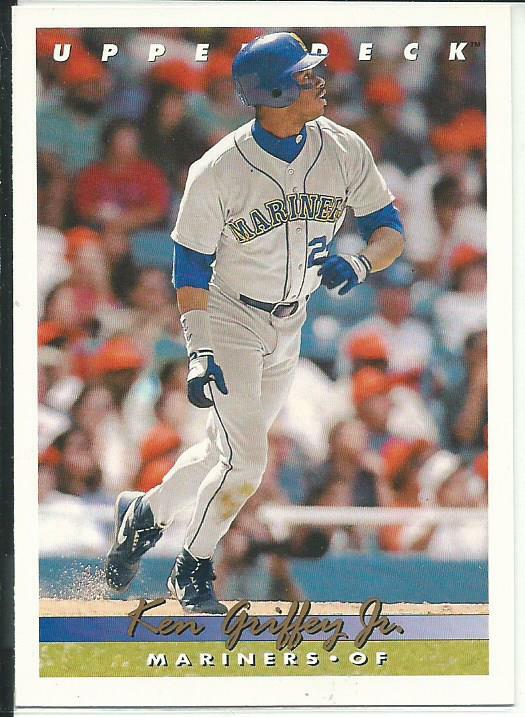 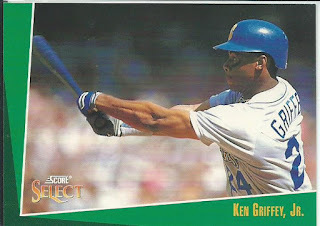 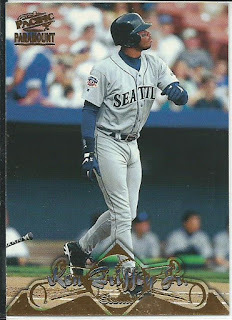 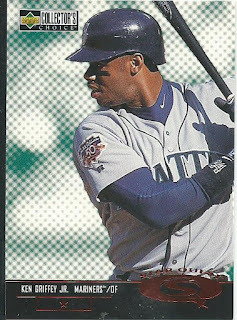 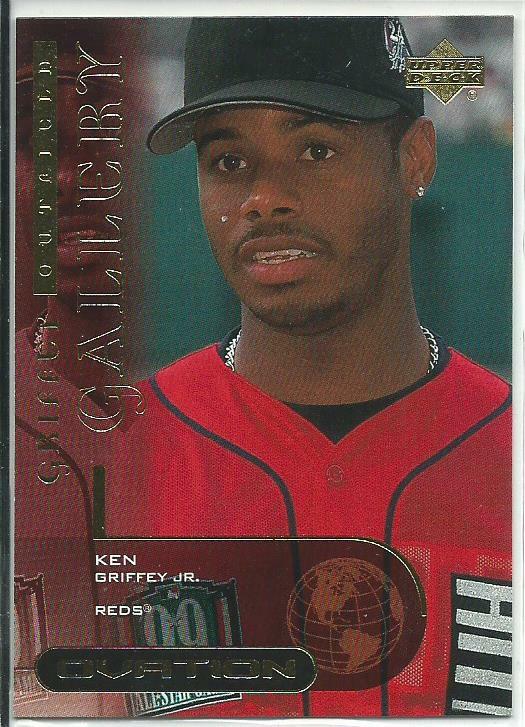 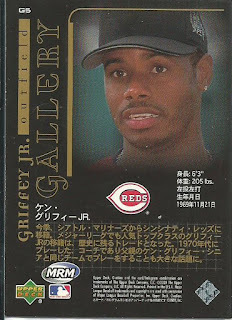 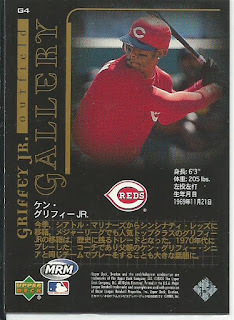 The first six cards are from the 2000 Japanese Ovation release, the Griffey Gallery insert set. 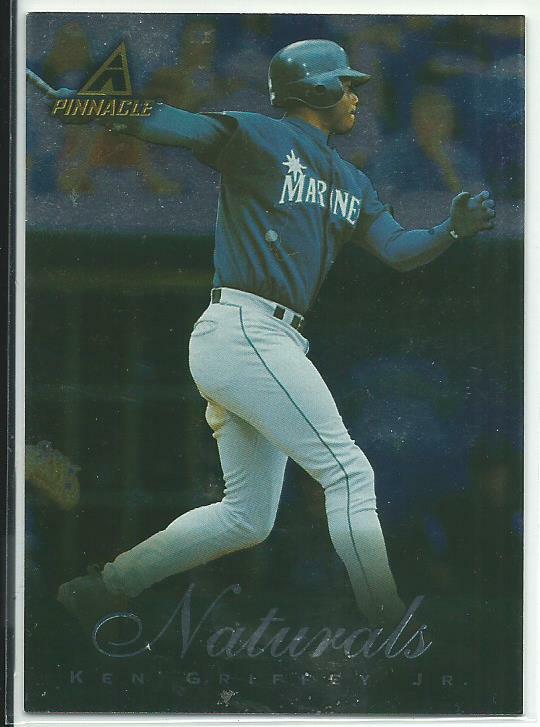 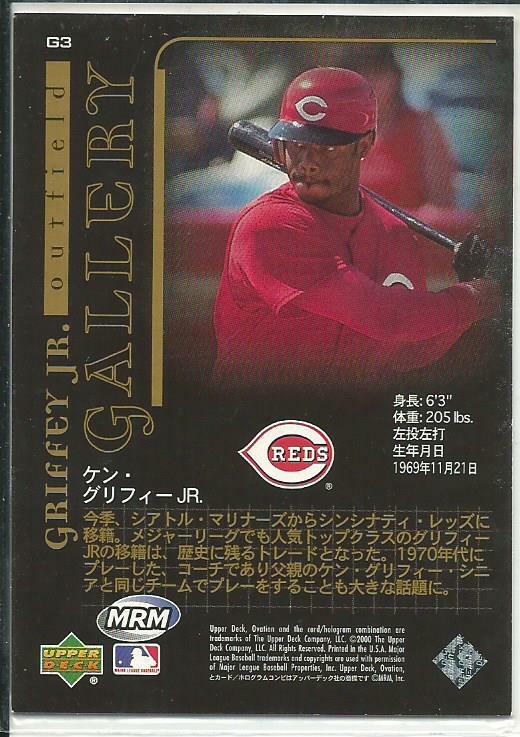 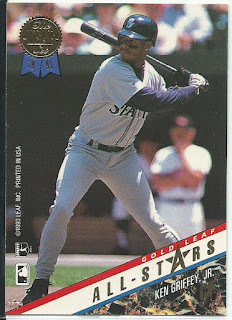 The Japanese Ovation release mirrored the U.S. in design but included NPB players although Griffey was included in two insert sets (the other one being Homerun Chronicles) plus some relic cards. 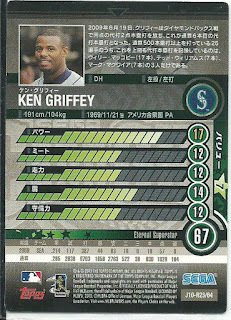 These are some cards that I have had a difficult time finding at a reasonable price but Ryan lives in Japan so they were much more accessible to him and I am very thankful he was happy to help me with my collection. 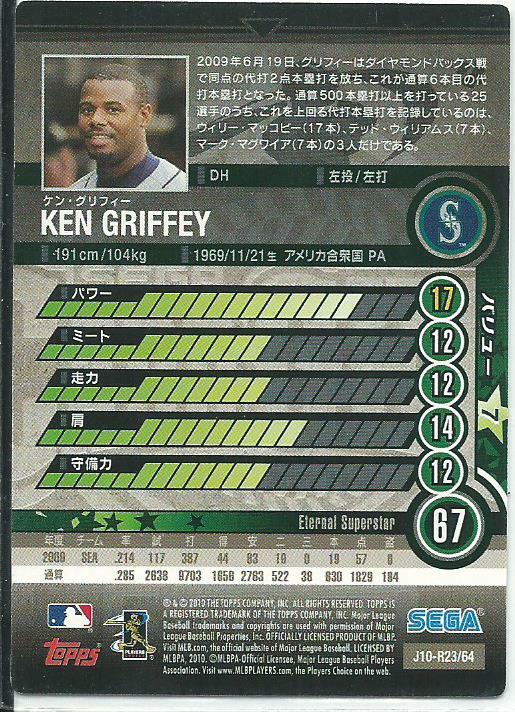 The other card he was able to find for me is the 2010 Sega Card Gen. 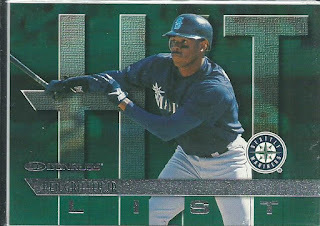 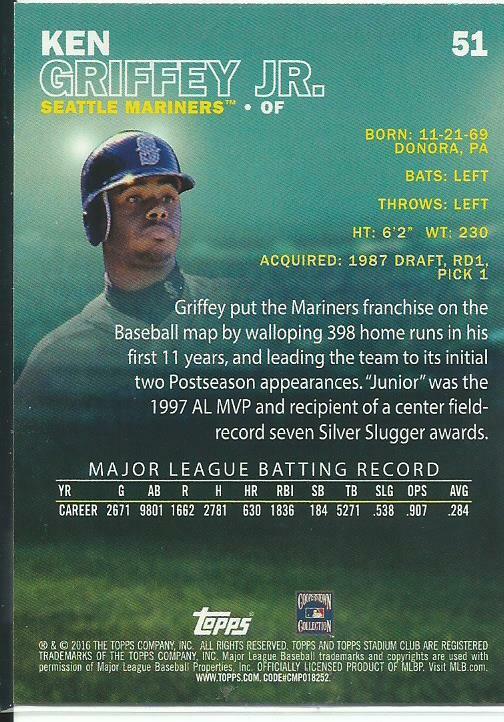 I have only seen a Griffey Sega Card Gen card a couple of times and I didn’t know but there are actually two Griffey cards on the Sega Card Gen checklist and with Ryan’s help I am halfway there. Time For My 7th Blog-versary Contest!